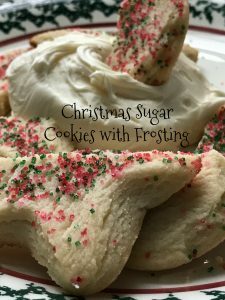 Sugar cookies with frosting is a fun idea courtesy of my son Bob. He made a comment to his wife Kim and this idea was born. First though, I will give you a little history pertaining to this recipe. 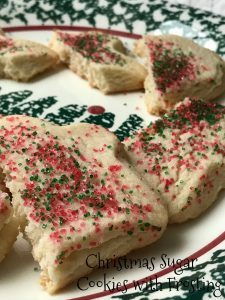 Every Christmas, for the last 40 years, I have made this recipe for sugar cookies. The recipe was given to me by my ex-mother-in-law, when I was a newlywed way back in 1977 at the tender age of 19. My first marriage didn’t last but this recipe has certainly stood the test of time. 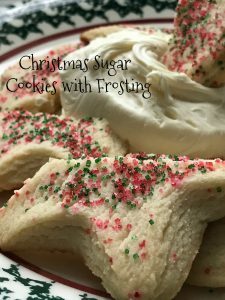 My kids have always told me that these cookies “taste” just like Christmas and believe me, they do! 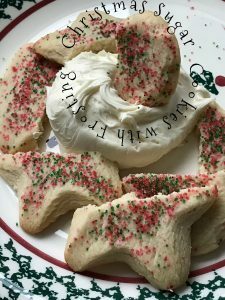 When the kids were young, they would often help with the frosting and decorating of the cookies but as the years went by, I often found myself making and decorating the cookies. 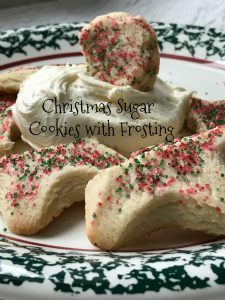 For many years I did the baking and decorating of the cookies, which I never minded doing. I would put on some Christmas music, pour a glass of wine, (or two or three) have a cigarette, (or two or three) stand at the kitchen island and decorate cookies. I always stored my decorated cookies between sheets of waxed paper, in an old square tupperware container. The cookies were stored on a shelf in my garage. Living in a cold climate state, the cookies would stay nice and cold in the garage. “I thought” they were out of reach. Let’s just say, I wasn’t fooling anyone by “hiding” the cookies. A large popcorn tin was also stored on the same shelf, in the garage, next to the tupperware container of cookies. This tin was filled to the top with layers of peanut clusters, coconut clusters, cornflake clusters and peanut butter balls. To this day, I can’t eat a peanut butter ball. I ate waay to many one year and can’t stomach them anymore. Over the last 10 years my holiday baking and candy making or should I say “cluster” making has decreased. I still do both but not to the extent that I did. I would say that I make about a quarter of what I use to make. My waistline or lack thereof, thanks me along with my type 2 Diabetes. This year I decided to bake a batch of Christmas cut-out sugar cookies before I went to Bob and Kim’s house for our annual Christmas Market Weekend. Each year we go to the Old World German Christmas Market located at the Osthoff Resort in beautiful Elkhart Lake WI. We usually make cookies and peanut butter balls at their house after the Market but this year I thought it would be easier for me to bake and bring the cookies. Bob and Kim could freeze the cookies and then frost them when they wanted too. About a week after our weekend, Kim sent me a picture of an empty 5 gallon ice cream pail. Kim had written, “Look at what your son did!” “He ate all of the cookies! 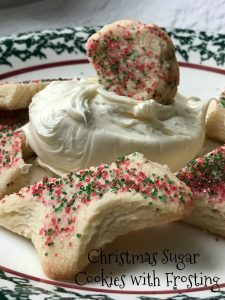 !” I then texted her back and said, “Why in the hell did he eat them all, they weren’t even frosted!” She texted me back, “He said he had to eat them because they were all cracked.” Well that got me thinking….why not make up a tray of all cracked and/or broken sugar cookies, serve them with my favorite, Marshmallow Fluff Frosting (I can eat that stuff with just a spoon) and some leftover sprinkles. Thanks Bob for a great idea! 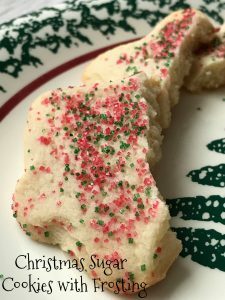 An old fashioned sugar cookie recipe that I've been making for 40 years. Cream together sugar and shortening, add vanilla and eggs. Mix together dry ingredients. Add milk and dry ingredients, alternately to the creamed mixture. Roll dough out on floured surface and knead in extra flour as needed. Use assorted cookie cutters, and cut out shapes. Place shapes on baking sheets. Bake at 350 degrees for 10 to 12 minutes or until golden brown. Place butter, marshmallow creme and vanilla in a small bowl. Beat on medium speed until well blended. Gradually add powdered sugar, beating after each addition until well blended. Blend in 1 tablespoon of milk at a time, until you have reached desired spreading consistency.